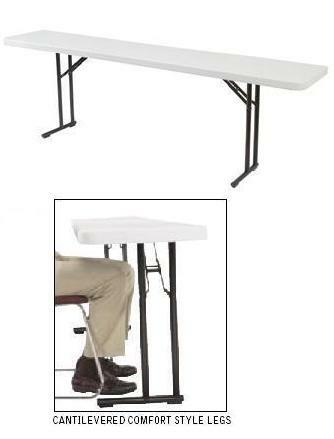 What is the difference between Flash Furniture's and National Public Seating's Folding Seminar Tables? 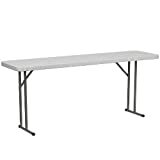 I just had a customer call a moment ago saying that they found a cheaper seminar table online at a competitor's site and wanted to know if I knew anything of the quality of those folding seminar tables. The model is question was model DAD-YCZ-180-GW-GG . The customer was comparing it to our Bt1872 folding seminar tables. On the surface, everything looks to be about the same for about $30 cheaper. However, a closer examination showed some key differences that future customers ought to consider. The first thing that will stick out to the careful investigator is that the Flash Furniture model uses a single folding hinge to support the frame and table top. The singe hinge is very flimsy; and, the likelihood of a table collapsing is increased with just one hinge to support. The National Public Seating model, on the other hand, uses a double-hinge support. The hinge on the NPS model also does not merely fold up at will; it also uses a push pin to keep the frame from folding up when you do want it fold up. The issue of weight capacity is a little more difficult to ascertain. Our competitor's website showed two different numbers: 220 lbs. and 299 lbs. When I went to the manufacturer's website, they did not have any additional information. So, I will assume the higher number is correct for argument's sake. Even at this higher number, the weight capacity does not really compare to the BT1872's 700 lbs. capacity. While most uses probably will not require the full utilization of all 700 lbs., this is pretty heavy (pardon the pun) evidence of the lower quality of the Flash Furniture model. Finally, there are several other points of comparison that require a little bit of speculation because of the dearth of available information. "Most of our chairs have a 2 year warranty for parts. If a replacement part is needed, simply fax in your parts request, and your part will usually be shipped within 24 hours. " The major problem with this warranty is that it does not even show if their tables are included under this warranty. I must assume that they have some coverage (I do not know of a company that does not warranty their table products at all); but, even if their tables are warrantied for 2 years like their chairs, National Public Seating warranties their products for 5 years.Second, the weight capacity of these different brands of seminar tables has already been considered; the only other thing that needs to be brought out is the strength of the materials used in the table's production. National Public Seating uses 16 gauge steel (the smaller the number, the stronger the steel) in their construction. Unfortunately, Flash Furniture does not have published details on this for their products. My guess (I told you I would be providing speculation with good reason) is that the gauge of steel could not be nearly as strong as the 16 gauge used by National Public Seating; otherwise, the weight capacity would not vary so much.Hopefully this post has illustrated the reasons for the difference in price between Flash Furniture and National Public Seating models. The Flash Furniture model would be considered a very low-end, entry-level table compared to National Public Seating's model.View National Public Seating Folding Seminar Table ExamplesFolding Seminar Table - Bt1872 National Public Seating Gray 18x72 Conference Table. National Public Seating Bt1872 Blow Molded Light Weight Folding Seminar Table. Blow-molded seminar tables make setting up and taking down a conference room much easier. 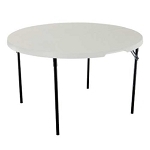 Seminar Folding Table - Bt1896 Gray Plastic Table - 18x96 National Public Seating Bt1896 Lightweight Seminar Folding Tables. The 8 ft. seminar table seats 4 adults comfortable on the 96 in. x 18 in. table top. This is a single pack for this table. Seminar Table - NPS Bt1860 Gray Folding Table National Public Seating, NPS Bt1860, Blow molded Lightweight Folding Seminar Training Table View YouTube Flash Furniture Table Video "812581018059 DAD YCZ 180 GW GG" View YouTube Video "NPS BT1800 Blow Molded Seminar Tables"A concise demonstration of our HD Ultra Blow Molded folding tables model BT1800. Seminar size blow molded tables. I just saved your post for when I get another piece of furniture. Thanks for the ecofriendly supplies! I didn’t know about most of them. This is one awesome post. Much thanks again. Really Great information about Flash furniture and National Public Seating. interesting approach. waiting for the next entries. With tables like these you have to have quality especially if you plan on using them over and over again for many years. We use ours on a daily basis as we offer seminars for both our employees and the customers. They have lasted and we haven't had any issues with any of them. These were recommended to me and I recommend them to everyone I know, that's how good they are! Thank you for your feedback and thanks for recommending them! Thanks for every other wonderful post. The place else could anybody get that kind of info in such an ideal approach of writing? I've a presentation subsequent week, and I'm at the search for such information.